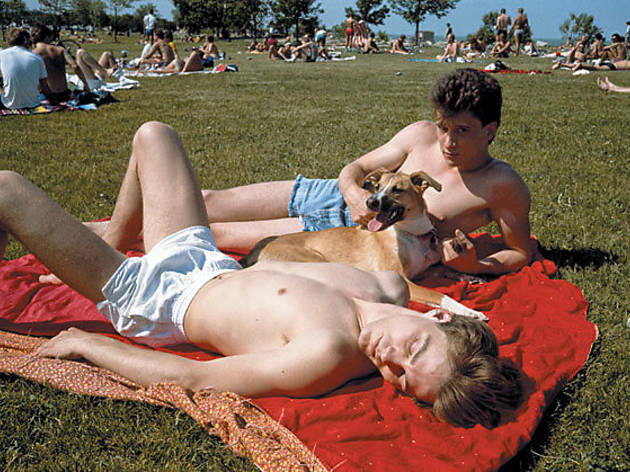 A new exhibition captures a summer of idyll during mid-'80s gay Chicago. 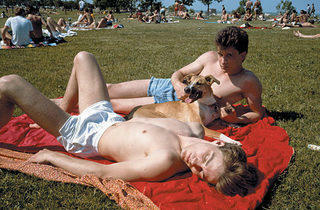 Photograph: Doug Ischar BEACHED MALES Gay sunbathers catch some rays at the Belmont Rocks. While Ischar didn’t have his point-and-shoot ready for that particular moment, his “Marginal Waters,” an exhibition of 13 large-scale images taken at the Rocks that summer, which opens Saturday 12 at Lakeview’s GOLDEN gallery, captures an emerging subculture in leisure mode. Ischar, 60, an associate professor of photography at the University of Illinois at Chicago, came here from San Francisco in the early ’80s after AIDS began claiming friends’ lives. He was enthralled by the city’s downtown leather bars and a pre-gentrified Boystown. Then a cellist, Ischar quit that gig to pursue photography at Columbia College; he wanted to document gay men in public spaces and in each other’s company. The Belmont Rocks, large lakeside rocks beside a grassy lawn at Belmont Avenue and Lake Shore Drive, had special resonance for him: This was his last Chicago summer (until he returned in ’92). He hung out there daily. “Marginal Waters” opens Saturday 12.